Such is the lot of the Manky Muscovy. 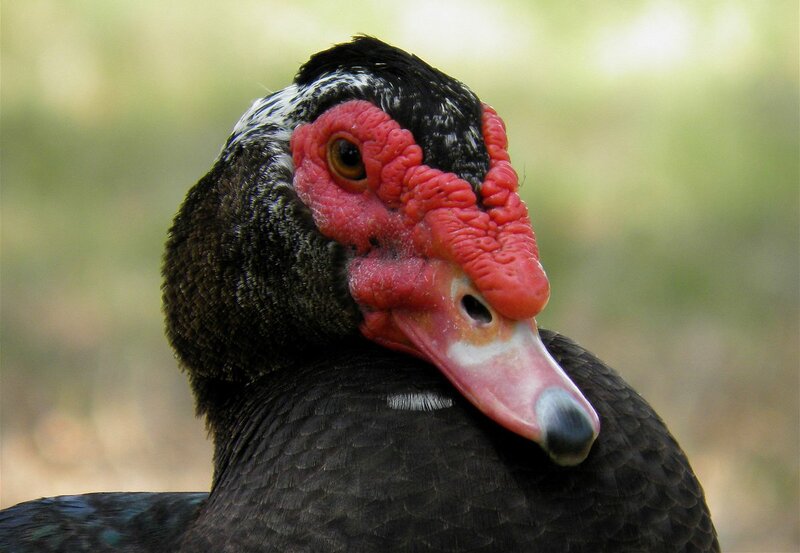 While most domestic ducks descend from the mighty Mallard, the other barnyard duck is the much maligned Muscovy. Actually, this lean, hardy bird has lots of fans in kitchens and at tables all over the world. However, the species sometimes referred to as the Barbary Duck appears very much out of place just about everywhere else. All Muscovies are large ducks with long talons and a wide flat tail. 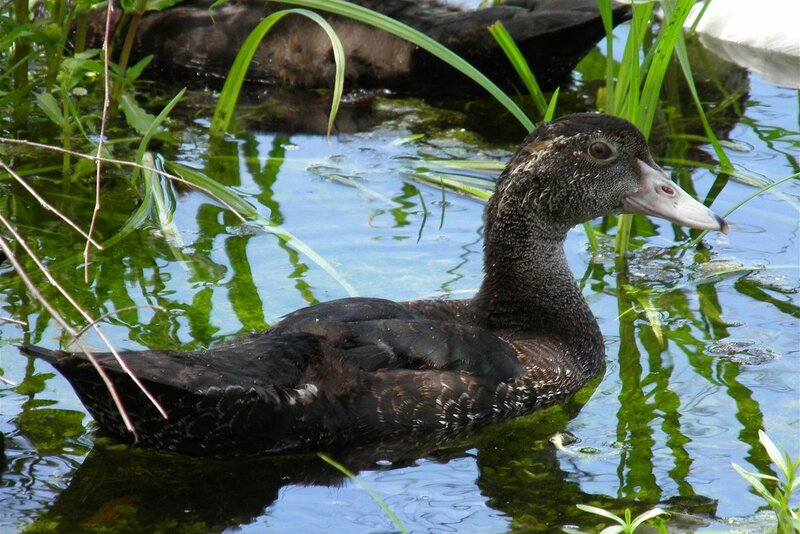 Wild Muscovies have very dark plumage, black with a purple or green sheen, as well as random pine green feathering on their wings and backs, white wing patches, erectile crests, and featherless faces. That rabid red facial skin is highlighted by mighty (some might say monstrous) caruncles, which are more mighty or monstrous in males than in females. 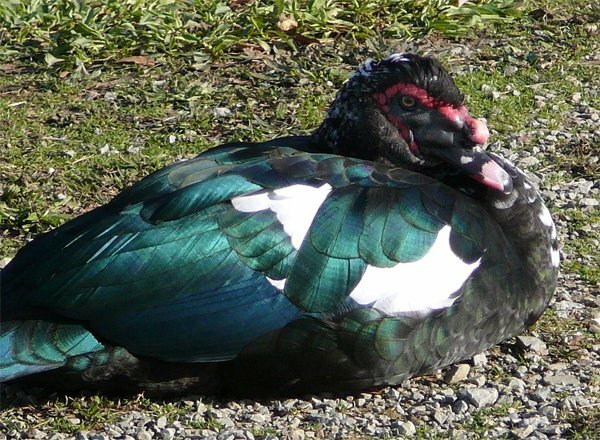 The domestic Muscovy duck displays the same caruncular charm, but appears in more colors than the basic black. 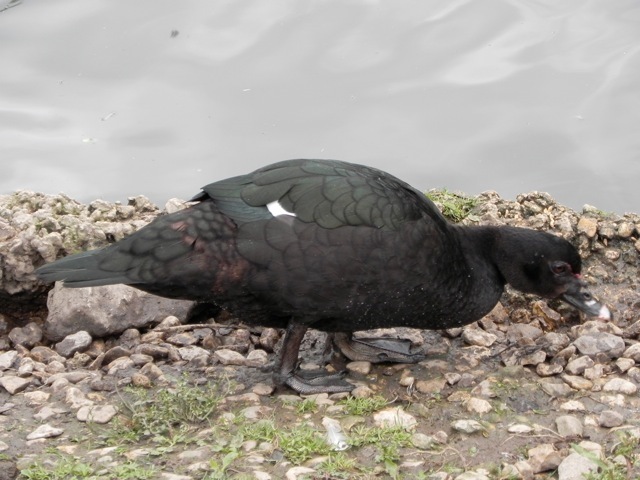 Many manky Muscovies are mottled or pied, while others come in brown, white, blue, and even lilac. The word manky means many things in British parlance from dirty and disgusting to inferior and worthless. Feral Muscovy Ducks seem to attract many of those epithets. Not only are the individual ducks hard to look at, but in groups, the feral populations create the same messes other masses of waterfowl do. Frankly, I find them gloriously grotesque, akin to New World vultures in their bare-faced beastliness. Do you agree? 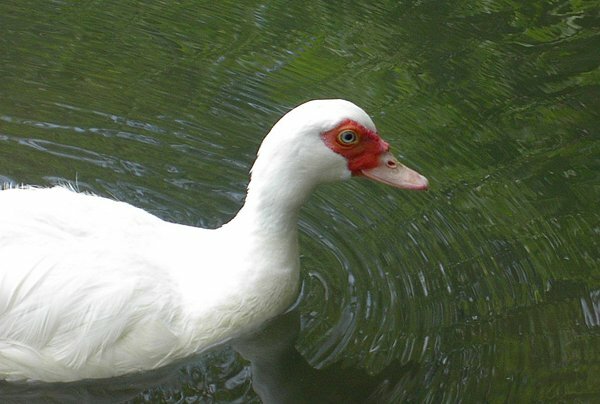 If you have great photos of manky Muscovy Ducks you’d like us to add to this gallery, send them to mike AT 10000birds DOT com! We have some photos of these that were living behind a hotel in Florida. I’ll dig them out and email them to you. They were so ugly I had to look them up at the hotel and found out what they were. I didn’t know they were rare. I think I’ve seen these beauties on the Peconic River near Riverhead, NY. I sent a couple of pics your way. Plenty of “manky” Muscovies down here in Costa Rica! 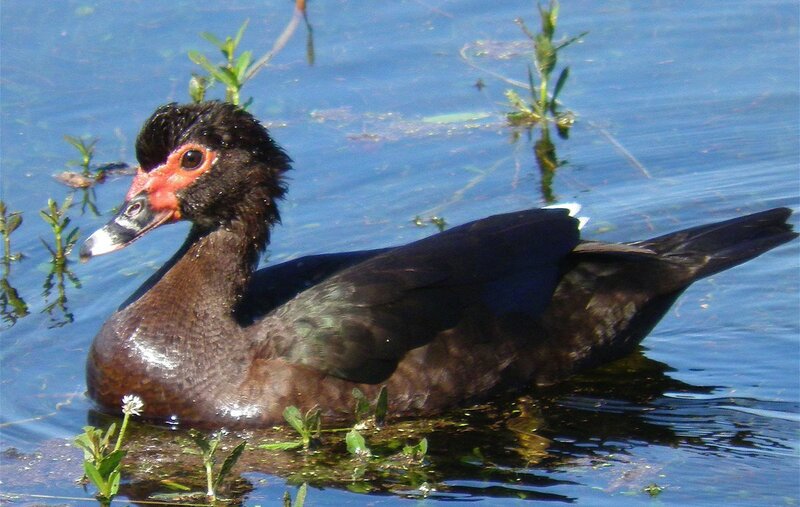 The wild Muscovy, which is native to South and Central America, has been “naturally” expanding its range north. It’s crossing into Texas has resulted in all kinds of problems with the US Fish and Wildlife service, which recently had to write and rewrite rules to conform with both the treaties that govern migratory birds and acknowledge that the species has been domesticated (some might say semi-domesticated) for centuries. So, I would say in the case of Patrick O’Donnell, the birds he refers to are not the least bit manky, at least if you exclude native fauna from your definition of “manky”. Now, what is manky is that you can cross these buggers with Mallards and the domestics varieties derived there from to get what is known as a “Mule Duck”. They are, like their equine name sakes, infertile. 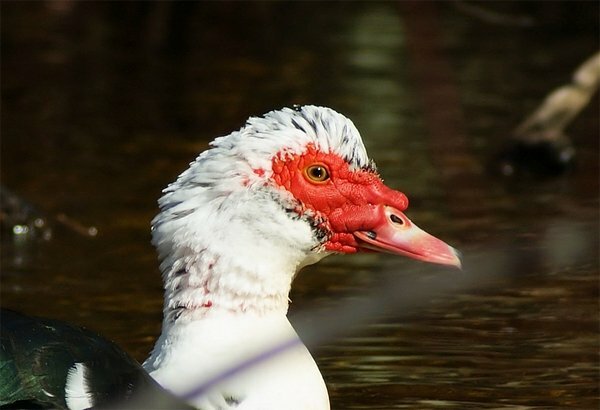 Denis, most Central American countries, in addition to having native, wild, Muscovy Ducks, also have large populations of feral domesticated Muscovy Ducks, which I imagine is what Patrick was referring to. Well, you asked for my opinion, so here goes. They look like two-birds-in-one! Really, I did a double take on the first one you presented. And then I lingered on all the rest. It looks like something from Photoshop! 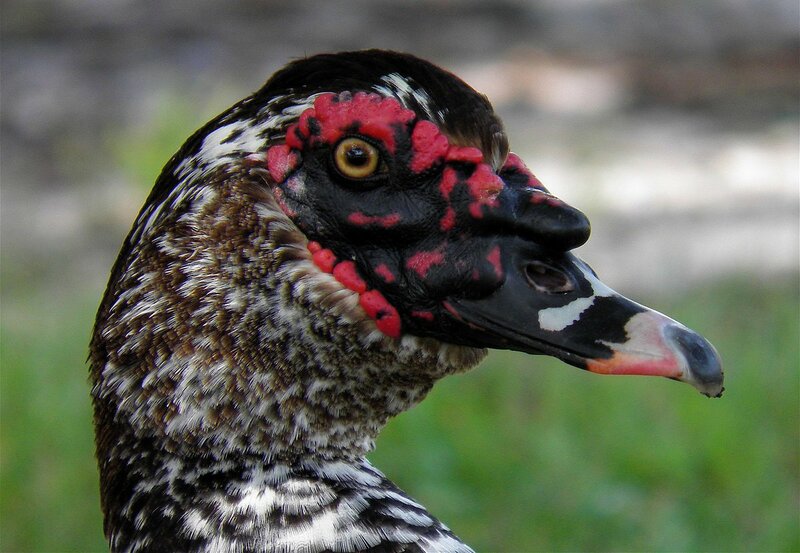 What are the large whaite ducks called without the red face? They are not ugly-they are just different.I feed 2 regularly in Sydney,Australia. We have one Muscovy in the reservoir behind us in Southern Ontario ( just outside Niagara Falls ). He is very friendly ( especially when food is involved ) and visits the fisherman. 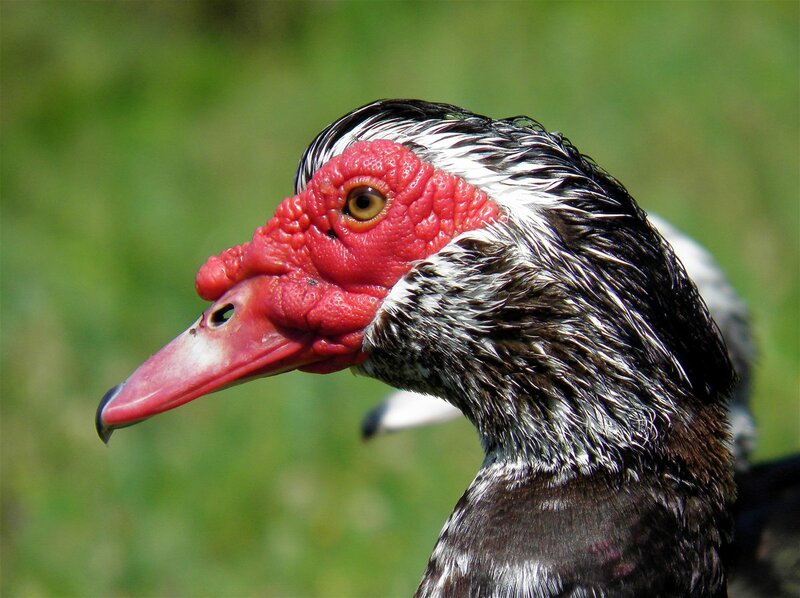 Randy, muscovy ducks seem to be as hardy as most other waterfowl, which means Gerald should weather winter well. Does anyone know what age they get the red face? We are raising a duck that I believe is a Muscovy. Just wondering how old he will be to get the red face. Amie, it looks like around 14-16 months old. @vez – those are Pekin ducks – domesticated white mallards developed in China. Ah, the Muscovy. To say they are common here in South Florida would be an understatement. 30-40 live by the small lake beside where I work, at least double that in the lake by my home. Anywhere it seems there is a lake or even a drainage canal. You’ll see packs of them roaming parking lots and crossing streets. 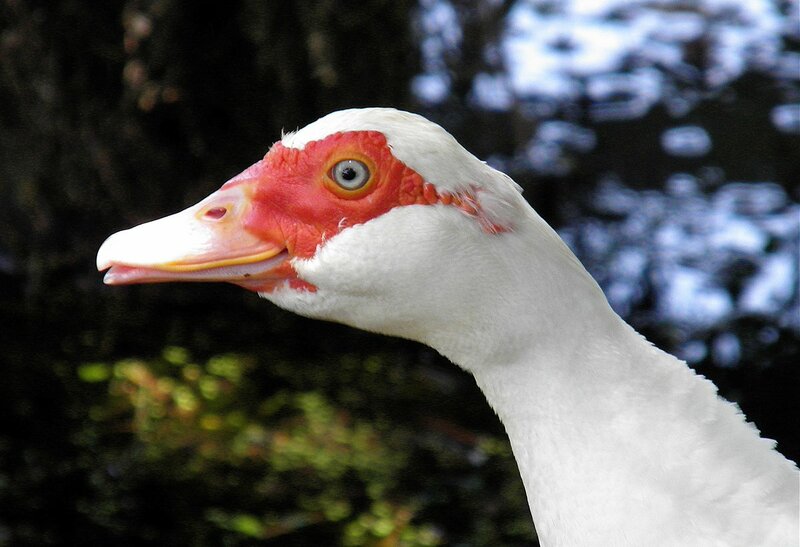 I love the Muscovy, but most people around here seem annoyed by these numerous and (rather aggressive)ducks. We live in ofallon Missouri and have a Muscovy duck leaving in our pond. I have never seen one before. Is it common in Missouri? We have a few of these glorious ducks living by the Thames River in London Ontario Canada. I see them almost daily. I am in Corpus Cristi TX and we have a bunch in our condo community. They act like dogs around here. There is one female who sits on her eggs in this big tree. I have a bunch of pictures I think they are wonderful. Personally I like them. They have character. i encountered one at the park the other day, it posed quite nicely. I was able to take some photos before it dove into the river. You don’t give enough credit to the mighty Muscovy! They are friendly, chatty, sweet and adorable (once you get used to the striking red faces). They wag their tails when they’re happy, and they appear to believe humans were put on earth to serve them. So I do! The boys huff and puff and strut like nothing I’ve seen before, and the ladies are incredibly resilient and determined. Don’t forget they are also much quieter than most ducks. I have had many Muscovy friends, and I have fallen in love with every one of them. Just walked alongside a half dozen of these beauties on South Pender Island, British Columbia. They were very tame and lovely birds that at first we thought were turkey vultures until we saw the waddle and webbed feet. Yes, beauty is in the eye of the beholder.